I want to talk about my back yard. 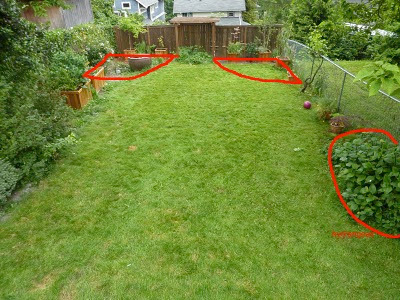 I recently invited someone over to look at my back yard and tell me if my ideas sucked or not. Basically I want patio pavers to make a border around my yard, maybe 4.5-5' wide and I was going to put more raised planter boxes evenly spaced for a veggie garden. The lady I invited over thought this was an awful idea. Her point of view was purely aesthetic - it wouldnt look pretty. It wouldn't invite you out into your back yard. If we were to sell our home it probably wouldn't appeal to anyone else. I mulled it over. I really thought about her suggestions and what I want from my back yard. I still want my paver border and veggie boxes but I decided that maybe incorporating her ideas into it would be a good idea. We have a lot of pretty things in our back yard and this might be a good way to keep them and do it in a healthy way (instead of putting them into containers). So in the below pic, here's my thought: The upper two corners would be where my "pretty garden" would be. In the bottom right I have two beautiful hydrangeas and I do love them. I would be so sad to see them go. They do very well in the shade and the top right corner is very shaded. To those who don't know, the chain link fence is gone and replaced with a wood fence so that side of the fence gets less sun thanks to that fence. I think they would do well in that corner. 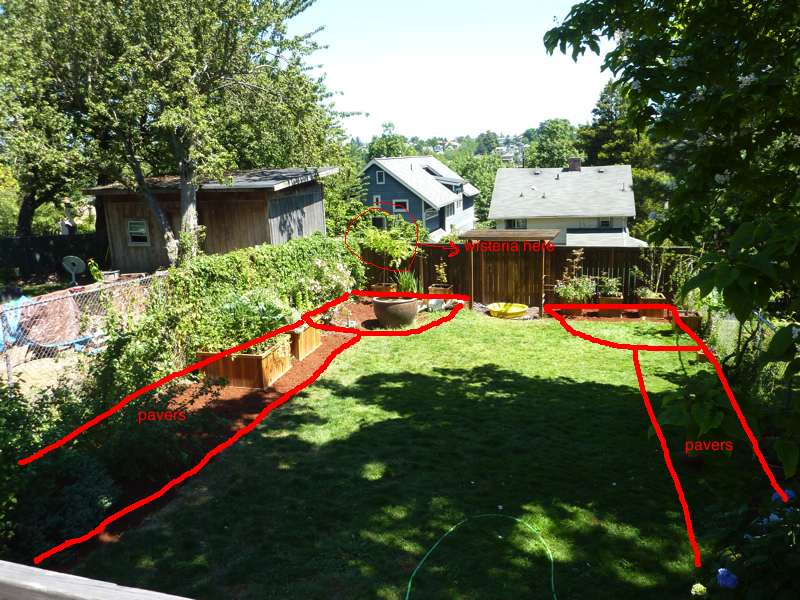 Here's my drawing showing where the pretty area would be and where the pavers would be. Eventually these borders would meet up with the house where a large patio will eventually be built, once the majority of the house is remodeled. To do it now would be silly because the work being done would destroy the patio up by the house. The below pic shows our Rose of Sharon. I would like this to go in the top left corner (see above) but this RoS is pretty big. I suppose we could cut it way down before transplanting, but either way it'll go back to being huge. 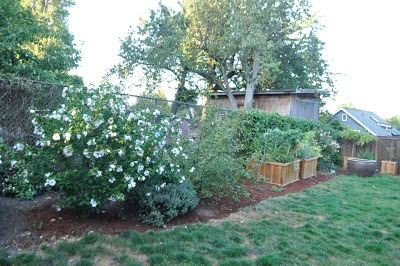 The only reason I even care about the amount of space the RoS and hydrangeas would take is because I do want other things planted back there. I have my serpentine blooming cherry tree and I would like to plant some (dwarf or semi dwarf) fruit trees like plum and fig. I also have some dwarf & semi dwarf Japanese Maples that would give some gorgeous color and texture back there. I definitely would need someone to plan this out for me. Where to put the plants, how to arrange them, and they'd have a better sense for what I can put in there without over crowding. Anything else I have I think I'd just have to keep in a container (if I really love it) or find i a new home.